Unique Caithness collaboration will delight both archaeology and gin enthusiasts. Archaeology and craft gin may seem like worlds apart, but two entrepreneurial companies from the far north of Scotland have teamed up to create a special craft gin, inspired by the prehistoric landscape of Caithness. 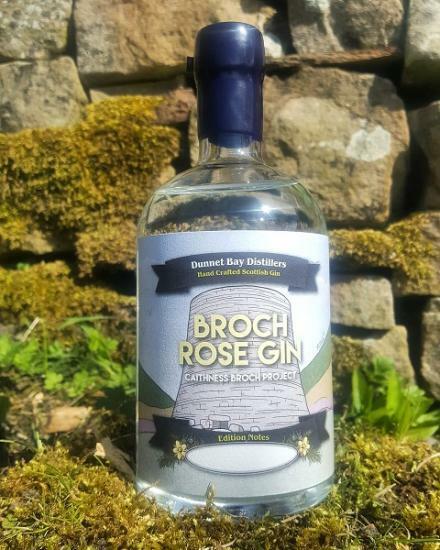 Caithness-based Dunnet Bay Distillers, highly commended for their Rock Rose Gin, have developed a limited edition with archaeological charity Caithness Broch Project (CBP) - inventively named Broch Rose Gin - proceeds of which will go towards supporting CBP. The new drink - described by Dunnet Bay Distillers as "gorgeously refreshing with a cooling sensation" and as a "more floral style of gin, with notes of heather and gorse" – makes use of plant remains found on the sites of monumental dry-stone built roundhouses in Caithness and the Northern Isles which are known as brochs. Caithness has more broch sites than anywhere else in Scotland! Broch Rose Gin has also been inspired by the botanicals found in a Bronze Age beaker found in the cist burial of a young woman at Achavanich, Caithness. Research undertaken on the beaker which is on display at Caithness Horizons Museum and Art Gallery, Thurso by archaeologist Maya Hoole, and archaeobotanist Scott Timpany of the University of the Highlands and Islands, revealed that the beaker contained traces of meadowsweet, Scots Pine and heather. The archaeologically themed gin was unveiled to the public on the 20th June, with special Iron Age themed canapes, created by Forss House Hotel chef Andrew Manson, who based his menu on archaeological evidence from across Scotland. Joanne Howdle, a director with Caithness Broch Project, said, "The collaboration between CBP and Dunnet Bay Distillers brings a new meaning to experimental archaeology! It may also inspire gin lovers to become amateur Indiana Jones's and travelling to Caithness and explore the archaeological riches that the county has to offer – stopping off on route of course to stock-up on Rock Rose Gin." Martin Murray of Rock Rose Gin, said, "As a business we focus on celebrating our hometown of Caithness and use local botanicals to craft spirits that showcase its heritage and provenance. Therefore, working with the Caithness Broch Project to craft this Limited Edition was a wonderful opportunity to find historical inspiration and ingredients for a new recipe whilst supporting this important local charity and giving back to the local community." Broch Rose Gin is available from Dunnet Bay Distillery shop or by calling 01847 851287 and is limited to 300 bottles. 100 bottles have also been made available at J.A. Mackays in Thurso, as well as 100 in Bin Ends in Wick. Caithness Broch Project are an archaeological charity seeking to raise the profile of Caithness as a heritage tourism destination, through the promotion of the county's broch sites and archaeological landscape.